The Davis Farmers Market comes to Central Park every Saturday from 8am – 1pm and Wednesdays, through October 30, 2019, from 4:30pm – sunset. DAVIS – Need your fill of fruits and veggies but don’t know where to go until your local farmers market opens? 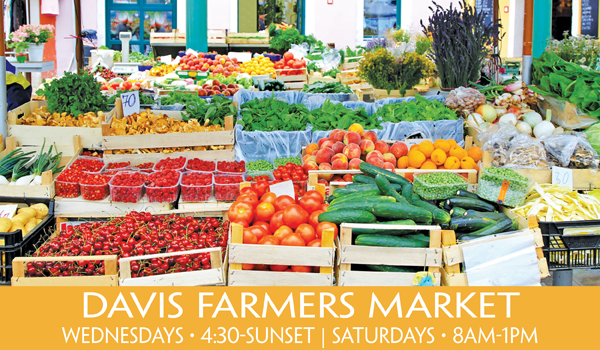 Not too far away is the Davis Farmers Market which is open every Saturday 8am – 1pm, and Wednesday 4:30pm ‘til sunset. This market is recognized as one of the best in the nation where you’ll find locally-grown fruits, vegetables, nuts, produce, meats, baked goods and more. For more information, visit DavisFarmersMarket.org.